So I signed up yesterday and should all be up and running on the 24th. I've been told that I should get 65mb down and 20mb up, what I'm trying to find out is how long my line is from the cabinet, on foot I'm only roughly 140m away but that may not be a true reflection!!! Will be more than happy with those speeds!!! Was just wondering if there was a mapping tool to tell me my line length from the cabinet. I have had 80/20 for a few weeks now. Was told I would get full speed - approx 150m from cabinet. Get 76/16 on average which I was told was about right. 80Meg is the maximum connection speed, once 4% is allowed for overheads you are down to the 76 figure you quote. I don't think you'll know until connected, depends on quality of line as well as length. It is crazy how people (not just you) but on a lot of sites are so concerned with every little ounce of speed. 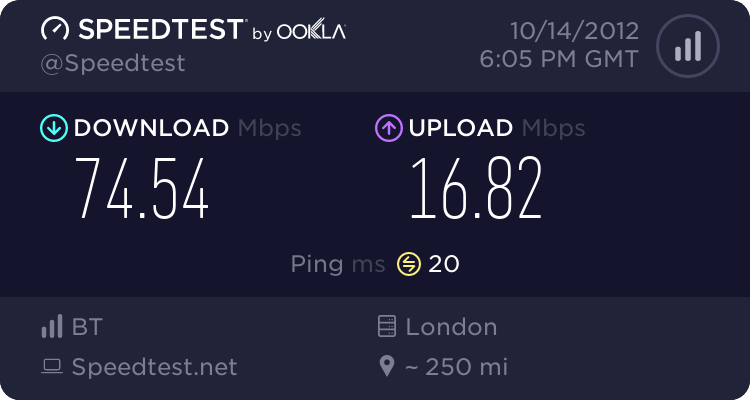 Anything over 20mb would be lovely, I'm getting connected on the 25th Oct and on the 40/10 from sky, didn't see it worth while paying the extra £30, hardware and server uploads speeds won't always push the full 80mb anyway. Xilo <--- The dog's danglies! Also, the actual line length can sometimes be significantly more than you'd expect from the above-ground geography (though the variance is not as high as the for the cab->exchange difference, it can sometimes be significant). It isn't just the downstream speed for some users: I was pretty happy with 11-ana-bit downstream from Be before I moved to FTTC, but I found the upstream speed limiting. Admittedly most home users don't work from home or want to run their own web services or similar from home, but even if you ignore P2P there are many things they do do that where upstream capability is significant. Uploading family photos and videos would be the key example and the bump from 0.4Mbit (as seen on most home accounts, of course some had the higher ~0.8mbit or more if on ADSL2+) to up-to-10mbit makes quite a difference for that even for occasional use. Off-site backups (or off-site storage more generally) is the other big one here. Of course now I've got used to getting 75+ reliably downstream, you'll not find me volunteering to move back to 11ish any time soon! (even though for the vast majority of what I do 11 down is more then sufficient and anything more is simply a luxury). extra £30? Its an extra £10 to make it £30/m for the Sky fibre Pro service. Obviously only worth it if your Openreach estimate is over 40/10 on the standard checker. I'm about 200 mts from the cabinet and was quoted 63.5 & 20. Sorry how do you locate the cabinet?